Introducing ClimbStation K.E.R.S. The Only electric driven climbing wall which takes advantage of the energy created by the climber. It took more than two years to design the new electronics and our new user interface. After several trials and using the latest technology and skilled engineers, we made a breakthrough. ClimbStation K.E.R.S. (Kinetic Energy Recovery System) produces energy from the climber´s weight and automatically adjusts the speed and settings. This new foundation dramatically improves the climbing experience and functionality. Automatic start: ClimbStation K.E.R.S makes it possible to have a safe automatic start feature without pressing a single button. 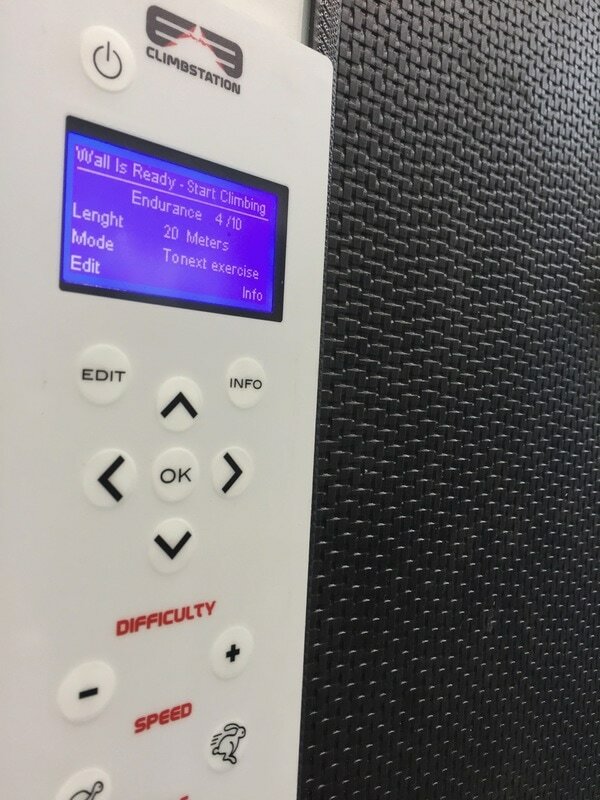 The wall detects the climber´s weight and starts the program owner has chosen as default. Adaptive speed control and new top speed: ClimbStation adjusts its speed according to the speed of the climber. The system will find the right speed for both light weight and heavier climber. With a 40% increase the new ClimbStation now rolls a top speed of 25 meters per minute. Energy savings: New ClimbStation works with 24V / 2A energy input. Compared to previous 230V / 10 A. This gives an average of 90% energy savings and enables the wall to be used globally in all outlets or even with just a battery pack for several hours, which is ideal option for events organizers. This is our first self desinged user interface and it was built to serve customer needs and meet the standards set by the inventor Kaarle Vanamo. User interface location: Maintaining the slim frame design, the user interface in now located on the frontside and can be used while climbing. Speed climbing: With a maximum speed of 25 meters per minute the wall enables speed training for experienced climbers. Looking for something unique? This stainless steel, icy-image custom ClimbStation was made for a private user. With a customized climbing belt and a backside banner you can make sure your company colors won ́t go unknowtised. We are able to customize dimensions, materials and software features. Entertaining and efficient Fitness & Sports equipment at any gym: High intensive and a thrilling full-body workout done by a natural movement of climbing. Differentiator for example at Hotels and Resorts: People are looking for activities, this product attracts attention, draws audiences and improves the overall experience. Events and Marketing: Direct cash flow (average event charge 5€ per 2-5 minutes) and a visible marketing tool to get your message out as users are likely to share memorable images and videos of their action. 5 years warranty, 2 years warranty on linear actuators and electronics. Delivery time: Manufacturing and preparation time is approximately 12 weeks from order. Please contact sales@climbstation.com to get the latest availability information.